It might be intimidating to write your own wedding vows, but it will be worth it when you’re standing up at the alter and you’re speaking from your heart to your new betrothed. 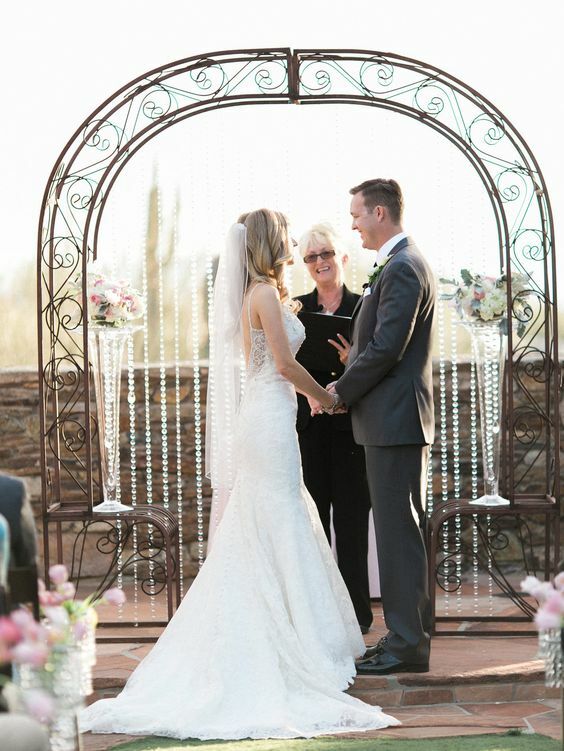 As lovely as traditional vows are, we love the idea of couples choosing to personalize their ceremony by creating their own promises to each other. If you and your partner are choosing to write your own vows, read these helpful tips before getting started. It may seem like you’re “cheating” if you get some help from other vows, but it can serve as great inspiration to help you formulate your own ideas. We aren’t saying to necessarily copy other vows, but to use them as a starting point to provide the push you need. Start by reading through traditional vows to see how they’re formatted, and read passages of text from your religion or certain faith to get some inspiration. You’ll quickly find how many beautiful texts there are to choose from to use as bits and pieces in your vows, or simply as inspiration for your own wording. It’s perfectly okay to talk about how you will write your vows with your fiancé before the wedding. In fact, you’ll probably feel a lot less anxious knowing that you are both on the same page in terms of tone and length. More importantly, you will want to both agree on the experience your vows will provide; meaning, decide whether you want them to be more serious and romantic, or more humorous. When writing your wedding vows, you don’t only have to think about the wedding day; you can also reflect on and write about your relationship as a whole. Take some time to think about your fiancé, why you fell in love, and when you knew he was the one. Ask yourself these questions and jot down your answers on paper: Why did you choose to get married? What struggles have you both gone through? What challenges do you picture in the future? What do you want to accomplish together? When did you realize you were falling in love? What qualities do you admire most in your partner? Once you finish adding all your notes, it’s time to craft the first draft. One common vow format is the four-part outline, which begins with an affirmation of love, praising your fiancé and what you love about them, stating your promises, and then closing it with a final vow. You can also start with a short story of the two of you and tie it into your promises at the end. 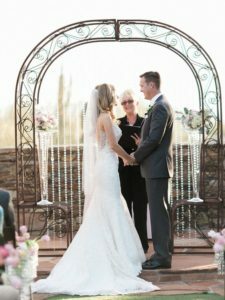 With so many beautiful statements from poems, spiritual texts, and movies, it can be hard avoiding the urge to use their direct wording, but your vows are meant to be unique to you and your partner. You can take inspiration from some favorite texts or quotes, but rearrange them and customize them in your own wording and try and make them specific to your relationship. Although you may think it as funny and a way to break up the stuffiness if you’re planning a more casual wedding, using embarrassing stories in your vows is something to avoid. If at your fiance’s expense, he or she may not appreciate you telling an embarrassing story to all your family and friends. And, because of the fact that it isn’t just the two of you at the ceremony, it is best to avoid using any inside jokes, nicknames, code words, or deeply personal anecdotes from your relationship. Your family and friends may have no idea what you’re talking about and the certain magic of the exchanging of the vows will be lost. You surely want to get everything in that you consider important, but it’s best to limit the length of the vows to one or two minutes. Otherwise, it may feel like it is dragging on and your guests may get bored after the fifth time you say the same thing. Pick the most important points, make them, and move on. When you practice reciting your vows, if they run longer than two minutes, edit them down. You can always write more of your thoughts in a letter to give to your fiancé on the morning of the wedding. Because you are going to be reading your vows out loud on your wedding day, it is important to practice them that way. By doing so, you can hear what you sound like and improve each time. Reading your vows out loud is a good way to find any tongue twisters and awkward long sentences you may not have caught when just reading them through silently. You want your vows to be perfectly curated, but you want them to sound perfect as well. For the text you’ll be reading from on your wedding day, you will want it to be free of any scribbles, edits, and extra markings to avoid confusion and stumbling on a particular part. Once you’ve finalized the notes and the copy, rewrite it to be as legible as possible, and organize it by breaking up the paragraphs and special sentences to be read in the correct pattern and flow. Consider presentation as well because it may end up in the photos or in a keepsake book later on. Follow these steps and tips when writing your vows and we are confident that you will craft the most beautiful vows ever written.